Our commercial fruit trees, or whip ball and burlap, are trees that are grown under a contract for growers to plant in a citrus grove. A contract between Sunset Nursery and the grove owner is typically entered into at least one year in advance, with a deposit due upon signing. 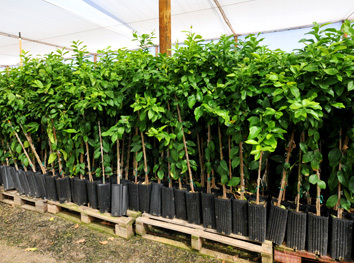 Prior to entering into the contract, the customer selects the scion and rootstock for the commercial fruit trees. All of the varieties listed on our availability list are available as grove trees. Please contact us for information on commercial fruit tree contracts and pricing at (928) 726-4896.